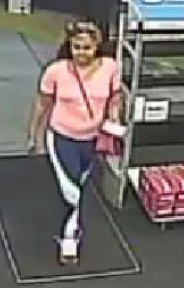 San Diego County Crime Stoppers and investigators from the Vista Sheriff's Station are asking for the public's help to identify and locate two unknown female suspects wanted in connection with a burglary that occurred at a gym in the City of Vista. On January 7, 2019 between 5:00 p.m. and 6:00 p.m., an unknown suspect cut the lock off of a locker at Planet Fitness located at 1980 University Drive. The suspect took credit cards, cash and a checkbook from the locker. A stolen credit card was used to purchase $1,000 worth of Visa gift cards at Walgreens located at 310 Sycamore Avenue. The suspects were seen driving to Walgreens in silver, 4-door Mercedes with no front license plate. Suspect #1 is described as a Black female adult with a heavy build. She has long hair and weighs approximately 220 pounds. She was last seen wearing a black, long sleeved shirt and camouflage leggings. Suspect #2 is described as a Black female adult with a medium build. She has long hair and weighs approximately 140 pounds. She was last seen wearing a pink top with blue and white leggings. Description of Suspect Vehicle: The suspect vehicle is believed to be a silver, 4-door Mercedes. Media inquiries about this case can be directed to Detective Lucia Rodriguez at (760)940-4907 or Lucia.Rodriguez@sdsheriff.org.